Earlier this year, Alexa let me borrow her copy of The Orphan Queen. It was my first experience with Jodi Meadows, and it definitely didn't disappoint. When I was invited to participate in the blog tour, I was thrilled. This has been one of my favorite reads of 2015 so far, and I'm so excited to celebrate its release! 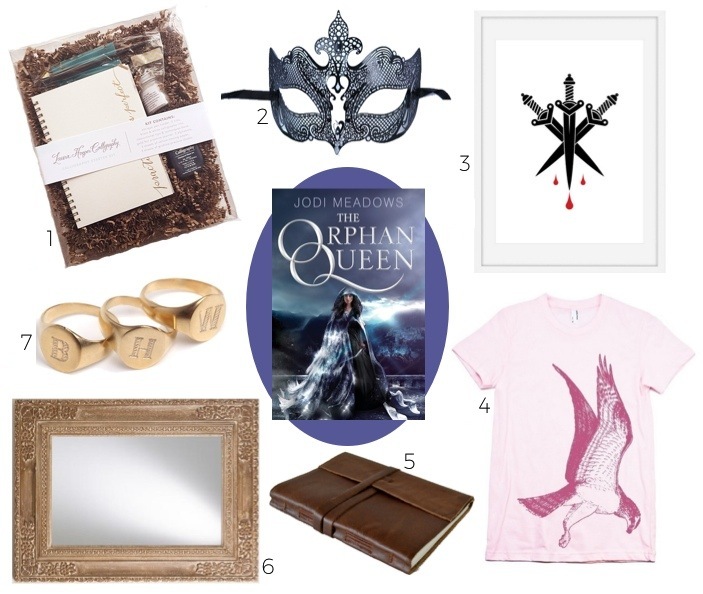 Rather than post my review (though it's coming soon), I decided to post a gift guide inspired by The Orphan Queen. I had way too much fun finding items that represented key characters or aspects of the book. Enjoy! 2. Filigree Metal Mask ($26) - There's a mysterious vigilante known as the Black Knife roaming around the city of Skyvale. The Black Knife's identify is a secret - hidden completely by a black mask. While this wouldn't quite do the trick, I had to pick something a little more stylish! You can fight crime and look fantastic. 3. Dagger & Blood Print ($5) - Speaking of the Black Knife, I had to include this dagger print that I found! This character becomes very important in the book - both to the plot and to Wilhelmina's development. I loved the scenes where they interacted, and I definitely couldn't wait to find out who was behind the mask! 4. Vintage Osprey Women's T-Shirt ($17) - Wilhelmina is a princess, but the Indigo Kingdom has conquered homeland. She's banded together with the other orphaned children of nobility and formed the Ospreys. Skilled at stealth and theft, they want to return Wilhelmina to her throne. Wear this shirt and pretend you're an Osprey. 5. Large Leather Journal ($57) - In addition to being a princess, Wilhelmina is a spy. She infiltrates Skyvale Palace with her best friend, Melanie, so they can study their enemy, take notes on what they learn and report back to the other Ospreys. If you're going on a covert mission, you better pack a journal for all your notes. 6. Antiqued Carved Disha Mirror ($184) - In The Orphan Queen, wraith is the toxic by-product of magic. Using magic has been forbidden, but wraith still pours across the continent, coming closer every day... It's believed that mirrors will prevent (or at least slow down) the wraith, so here's one to keep you protected. 7. 9K Gold Signet Ring ($220) - As I've mentioned, Wilhelmina is a princess who's been displaced from her throne. While she's currently in Skyvale undercover, there may come a time when she needs to prove that she has the right to rule. Thankfully, she's got a signet ring that leaves no question about her identity! 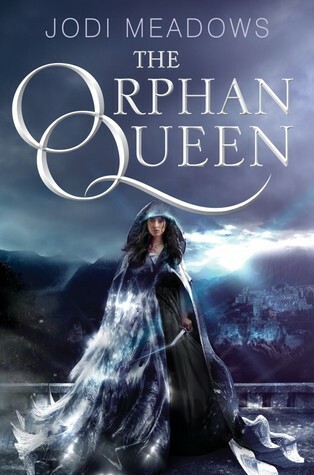 Pre-Order The Orphan Queen - out March 10th! This gift guide gets me excited to read the book! Gorgeous picks! I love these book gift guides :) They're so creative! UGH MY COMMENT GOT EATEN BY THE INTERNET.